Working on a book based around a navy captain during the Napoleonic Wars, a visit to the National Maritime Museum in Greenwich seemed like an ideal way to start this visit to London. I can remember going to all the Greenwich museums growing up, but it has been a very long time. The National Maritime Museum is the leading museum of its kind in the UK and probably one of the best in the world. 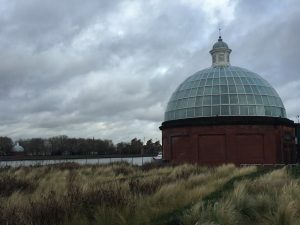 It is part of a complex known as the Maritime Greenwich World Heritage Site and includes the Royal Observatory and 17th-century Queen’s House. In 2012 the complex was given the overall name of Royal Museums Greenwich along with the famous Cutty Sark which stands nearby. Greenwich has always had associations with the sea and the navy has roots on the waterfront while Charles II founded the Royal Observatory in 1675 for “finding the longitude of places”. The home of Greenwich Mean Time and the Prime Meridian since 1884, Greenwich has long been a centre for astronomical study, while navigators across the world have set their clocks according to its time of day. Something about this knowledge has always given me a slight sense of awe when visiting this part of Greenwich. 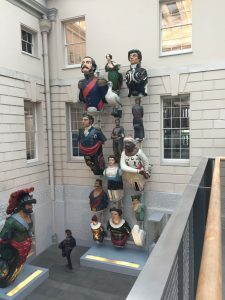 The National Maritime Museum has a huge collection on Britain’s seafaring history including art, maps and charts, manuscripts, models and plans, navigational instruments and personal items belonging to important historical figures such as Nelson and Captain James Cook. Flamsteed House, the original part of the Royal Observatory, was designed by Sir Christopher Wren and Robert Hooke and was the first purpose-built scientific institution in Britain. In 1953, the Old Royal Observatory became part of the Museum. The 17th-century Queen’s House, an early classical building designed by Inigo Jones, is the keystone of the historic “park and palace” landscape of maritime Greenwich. The Queen’s House was refurbished in 2001 to become the heart of displays of art from the Museum’s collection. In May 2007 a major capital project, “Time and Space”, opened up the entire Royal Observatory site for the benefit of visitors. The £16 million transformation features three new modern astronomy galleries, four new time galleries, facilities for collections conservation and research, a learning centre and the 120-seat Peter Harrison Planetarium designed to introduce the world beyond the night sky. 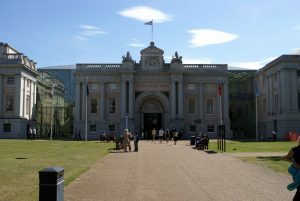 The National Maritime Museum has galleries exploring various aspects of Britain’s maritime history. 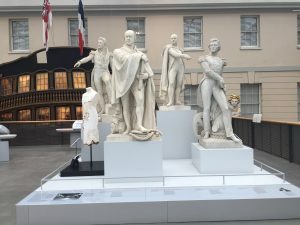 A gallery dedicated to Nelson and the Navy tells the story of Admiral Nelson, his battles, his life and his death at Trafalgar, and sets the battle in the context of the wars against the French in the late eighteenth and early nineteenth century. It describes the ships, the sailors and how they lived and the way the navy was perceived at home. The gallery concerned with traders explores the relationship between Britain and the wider world, particularly the powerful East India Company which spread its influence until it controlled huge areas of territory in India. I found this fascinating, partly because I studied this at University and partly because I spent time researching the Company in India when I was writing about Assaye in An Unconventional Officer. Another gallery covered the difficult subject of the transatlantic slave trade, both up to abolition and beyond. I thought this topic was well-handled, looking at both slavers and abolitionists as well as the slaves who fought back against their masters in places like Haiti. Other galleries explored the maritime history of London, the first world war and in Voyagers, the personal significance of Britain’s maritime story. I particularly liked the exploration of Turner’s famous painting of Trafalgar which analysed the painting and it’s meaning in the context of national pride and naval power following the battle. The museum is huge and there is so much to see and do that it is easy to miss things. Work is in progress on a new gallery and there are various temporary exhibitions, a children’s play area and the fabulous Great Map. If the museum has a fault, it is that the various galleries are sometimes hard to follow in the correct order. Especially as it is sometimes possible to enter a gallery from either end it is easy to find yourself going around in the wrong order and there is no numbering of exhibits to help with this. With a fairly good background in history it didn’t really bother me that much, but I can imagine it would irritate some people. 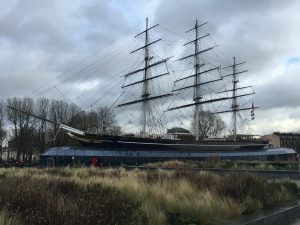 I loved the museum along with the Royal Observatory, which completed the story of some of the scientific aspects of navigation and the Cutty Sark, standing 400m outside. I didn’t manage the Queen’s House this time around, although I’d like to go back to it. The Cutty Sark is one of my clearest childhood memories. It was a Sunday afternoon treat, even just going to see it. Going aboard was even better. The ship was one of the fastest tea clippers in the world and there was something romantic for me as a small girl, standing on the deck gazing up at the tall masts and trying to imagine billowing sails and a fresh breeze at sea. I was devastated in 2007 when the ship was badly damaged by fire and have followed the progress of the restoration. We used to take the bus to the Isle of Dogs back in the sixties and seventies and then walk through the foot tunnel to Greenwich. The foot tunnel is a piece of history in itself, a masterpiece of late Victorian engineering which opened in 1902 and was built to replace an expensive and unreliable ferry service which took workers living south of the river to work in the docks and shipyards. 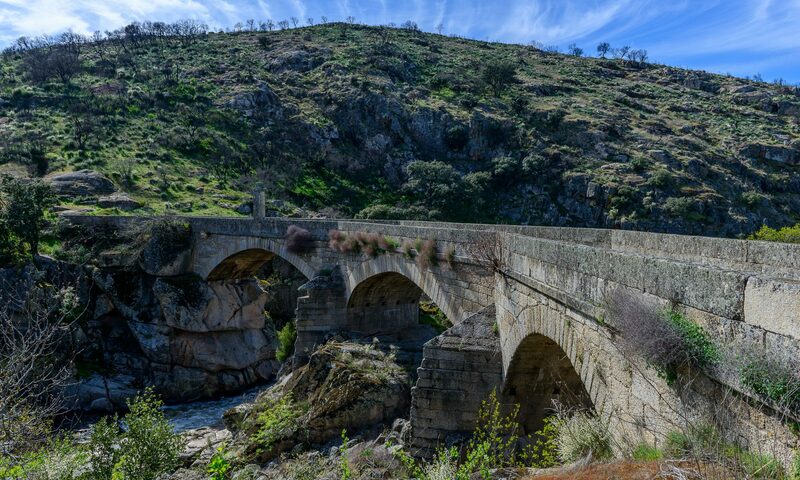 The entrances at each end are beneath glazed domes and I can remember the joy of running through the tunnel calling out and hearing my voice echo, bouncing off the walls eerily. We used to count the steps at each end. There were lifts but for some reason we seldom used them. A visit to Greenwich is both a research aide for the new book and a trip down memory lane. The strong sense of standing with both feet in maritime history is just what I need as I embark on the second half of my book which places me aboard a Royal navy ship bound for Copenhagen in 1807 under Admiral Gambier. But there is also a sense of standing with at least one foot in my own past, a child growing up in the East End with parents who took us to some historic site almost every weekend. There is a strong link between that excited little girl standing on the deck of an old ship and trying to imagine how it felt to sail in her and the woman writing a novel of those who did. I owe that as a debt to the parents who gave me that sense of history and why it matters to all of us. The new book, An Unwilling Alliance, is due for publication in April 2018.